To say that there were very high expectations for Demetrius might be a grand understatement. Demetrius had succeeded by most of the Imperial rubrics of success. He was a soldier of distinction. He had risen to leadership within the legions. He had the ear of influential and important members of Roman society. Overall, he had a comfortable and secure life. All of this was largely because he was the son of a Roman senator.Though the Senate was not as powerful as it once had been it was still a force to be reckoned with under the leadership of Diocletian. The strength of the emperors and leaders had weakened the influence of the Senate for sure but it had not stripped this illustrious body of its power and influence within Roman society. Because of his status as a child of privilege, Demetrius was held to exceedingly high standards and expectations both at home and in the larger society. Even Roman peasants--who were not the subject of any expectation--knew that Demetrius should be doing more, knowing more, and saying more. In so many ways, his status condemned him to living in the gap between success and failure never truly knowing if he could ever do enough to please his father, his family, or his society. All of this is part of the reason it came as such a shock when Demetrius was accused by the Emperor's men of being a Christian. In Diocletian's Rome, this was an unforgivable offense. Assuredly, Demetrius' father was surprised. It seems that Demetrius had given up seeking after success as the Empire described it. 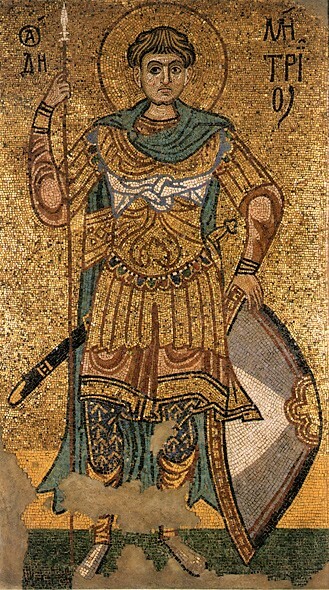 Instead, he was following after Jesus whom had been executed only a few hundred years previous.Even more surprising to everybody with their high imperial expectations was that Demetrius refused to deny his faith even when threatened with the loss of everything or promised great rewards to recant his faith. It seemed that Demetrius wasn't even working from the same system of thought.They ran him through with spears because he wouldn't live up to their standards and expectations and insisted on following an executed God.